It's A Disney World After All: Splish Splash! This week's podcast features the 4 of us talking about our favorite things to do at the water parks...therefore, I thought I'd take the topic idea and extend it to my blog. It is, after all, almost water park season (and down in Florida, heck, it probably already is water park season) and I thought I'd give you a sort of mini guide as to what the possible dos and don't dos are for these two incredible water playgrounds. Especially since we all only got to share one do at each park. That simply isn't enough for me...I have to talk more! lol! 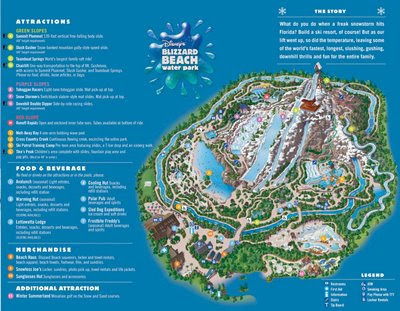 So, first things first...let's start with Disney's newest water park...Blizzard Beach. So, what is it that I love about Blizzard Beach? First off, I love the Toboggan Racers. This is the ride where you race eight people on a mat and try to be the first one down. I always try so hard to get down the slide fast, unfortunately, I'm too light to make it all the way to the bottom! I have never once made it to the finish line! The other thing I really love are the Runoff Rapids. Here there are 3 slides you can choose from, some of which are enclosed and some are not. It's just fun because they seem to go on a lot of twists and turns. So, those are some of the things I love about Blizzard Beach, but guess what? There are definitely some things I can skip. First on that list...Summit Plummet! I don't know how people can do this! I seriously get sick just looking at this attraction. I couldn't imagine going 55 miles per hour down a slide with nothing to hold onto but my bathing suit! No way, no how! I also don't really care for the Cross Country Creek, otherwise known as a Lazy River. I don't know if it's just because it's a LONG trek around or that I get bored just sitting in the water quickly or if it's because of the icy, icy water that falls on you...this is one ride I will usually only go on once per visit to a water park. Any water park. Now, we move on to the more laid back Disney water park...Typhoon Lagoon. 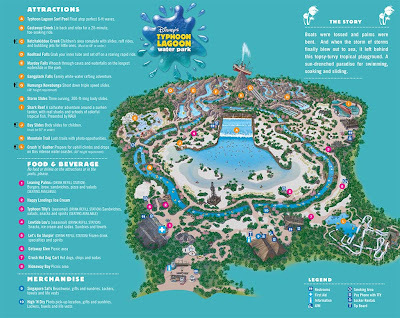 Typhoon Lagoon is themed around a hurricane, earthquake, and volcano all hitting the same area at the same time, causing this mass chaos and making the "locals" think about turning it into a water park. Brian and I did enjoy this park too...but it wasn't as fun for us as Blizzard Beach was. Now, that's not to say it is a bad park...we definitely enjoyed this one too...but I think what we enjoyed the most were the more thrilling options. Next, I really liked the Keelhaul Falls and Mayday Falls. Like the Runaway Rapids at Blizzard Beach, I love the twists and turns you go on in these types of slides. I also definitely enjoyed Gangplank Falls, which is this park's version of a family water ride. It's so much fun getting to experience some of the water rides with your family, rather than just by yourself. As for what I didn't enjoy...let's just say Humunga Kowabunga did not sit well with me. We'll leave it at that. I also didn't really like Shark Reef. While the concept is really cool, as I love snorkeling, it was just very difficult to actually manage. The water was freezing, my mask kept leaking and I ended up WAY behind...so far behind, then next group actually started departing before I had had the chance to reach the end. As for who I think would enjoy this park...definitely people who are looking to relax. Those who just want to sit in the sun and soak up the rays. Although, this park has it's thrills...it just doesn't have as many as I think Blizzard Beach has. So, there you have it...my tips on what does and doesn't work at the water parks. Of course, your ideas on what's fun at the water parks will probably differ from mine, but the best thing about the parks is no matter what you really love, it really is all about getting that fun in the sun. I have never been to a water park at Disney. We are going to try one when we go next April. Thanks for the info. If you HAD to pick one (I have a 5 year old little girl) which one would she enjoy more? Just wanted to let you know, I sent you an email with my answer! :) Hope it helps! This is very well said! Both parks have something for everyone, and it is nice that they appeal to different audiences. That makes is a unique experience to visit both water parks! Mike, I love how you give a teacher comment to just about everything. I feel like I've been graded! hahahaha!